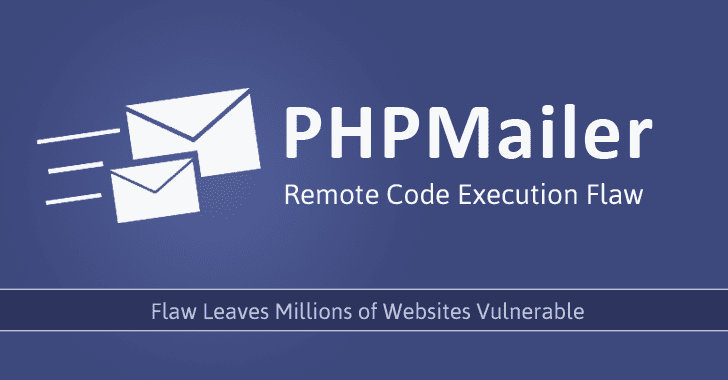 A critical vulnerability has been discovered in PHPMailer, which is one of the most popular open source PHP libraries to send emails used by more than 9 Million users worldwide. Millions of PHP websites and popular open source web applications, including WordPress, Drupal, 1CRM, SugarCRM, Yii, and Joomla comes with PHPMailer library for sending emails using a variety of methods, including SMTP to their users. Discovered by Polish security researcher Dawid Golunski of Legal Hackers, the critical vulnerability (CVE-2016-10033) allows an attacker to remotely execute arbitrary code in the context of the web server and compromise the target web application. "To exploit the vulnerability an attacker could target common website components such as contact/feedback forms, registration forms, password email resets and others that send out emails with the help of a vulnerable version of the PHPMailer class," Golunski writes in the advisory published today. Golunski responsibly reported the vulnerability to the developers, who have patched the vulnerability in their new release, PHPMailer 5.2.18. All versions of PHPMailer before the critical release of PHPMailer 5.2.18 are affected, so web administrators and developers are strongly recommended to update to the patched release. Since The Hacker News is making the first public disclosure of the vulnerability in the news following Golunski advisory and millions of websites remain unpatched, the researcher has put on hold more technical details about the flaw. However, Golunski has promised to release more technical details about the vulnerability in coming days, including a proof-of-concept exploit code and video demonstration that will show the attack in action. We will update this article with additional information on the PHPMailer vulnerability, exploit code and video demonstration, once the researcher makes it public. Golunski has released Proof-of-Concept (PoC) exploit code for PHPMailer remote code execution vulnerability. "A successful exploitation could let remote attackers gain access to the target server in the context of the web server account which could lead to a full compromise of the web application," Golunski said. You can find exploit code here.